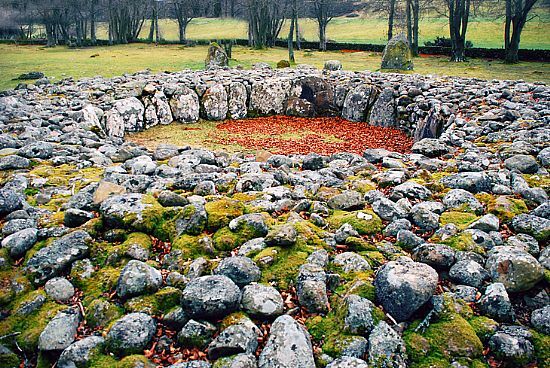 The Highlands Astronomical Society has some fine examples of ancient sites in its area, amongst them the Clava Cairns near Inverness – stone chambers with standing stones round about. And the opportunity to visit them with an expert guide came during the mini science festival organised by the Society in late March 2009 as part of their activities for the International Year of Astronomy. Douglas Scott lives in Tain in Easter Ross where he runs his craft business Tain Silver. 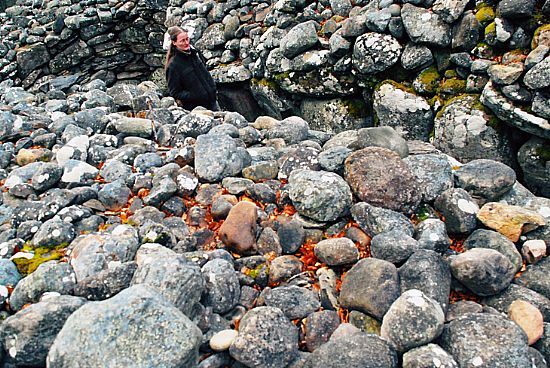 Over the past thirty years Doug has been studying the stone circles and chambered cairns of Scotland, and has built up an immense body of information about them. It's appropriate that his theodolite was a gift from Professor Alexander Thom, since Doug has carried on Thom's work and taken it forward to new insights. In order to find out about the relationships of the various sites to the movements of sun and moon, he has visited them at every season, seeking out the key moments when a flash of light will touch a standing stone or find its way into the darkness of a stone chamber. His photographs elegantly show the ancient alignments through paths of light, from the bright evenings of summer to cold winter nights. 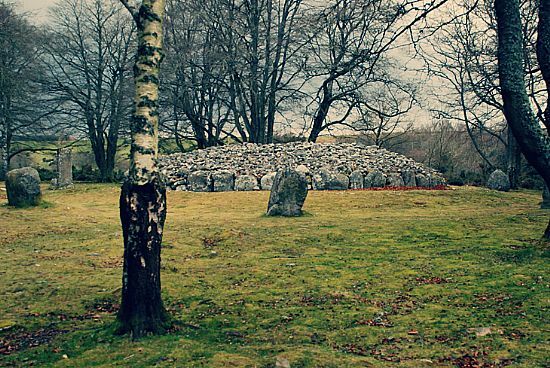 The Clava Cairns are in the neighbourhood of Culloden Battlefield, by the River Nairn. When the cold wind blows over the battlefield, the cairns are in a more sheltered lie of the land, with trees around. The site would have been more open when the original builders were there, more than 4000 years ago, and indeed it looks as if they were thinking in terms of a bigger landscape, as there are up to 15 cairns in the valley of the Nairn, as well as the remnants of others. The roofs of the cairns have gone, and we can see directly into their interiors. 'It's thought from the quantities of quartz found during excavations, that this was laid on the upper surface of the cairns, making them a dazzling white in the sun or moonlight,' Doug says. Each of them is surrounded by a circle of standing stones. 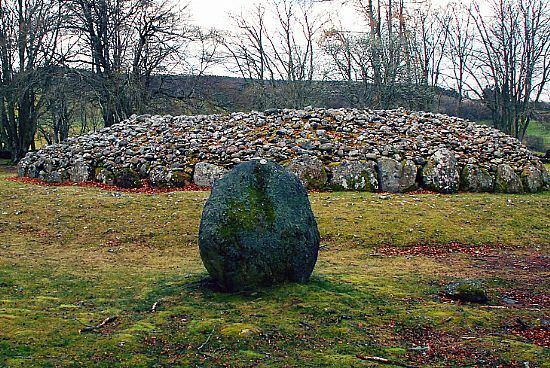 The north-east cairn and the south-west cairn have 11 around them, and the central cairn 10. 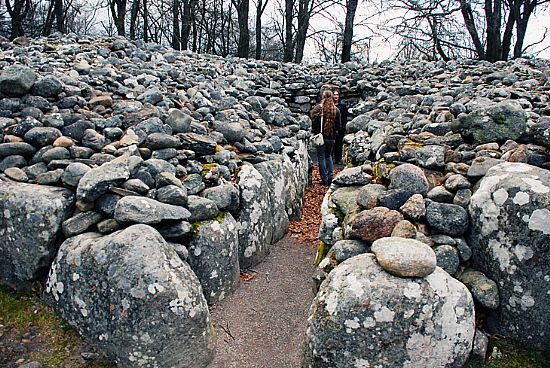 The central cairn also differs in another way. It has no entrance passage, but on the ground around it are the marks are three causeways. The other two cairns have no causeways – but each has an entrance passage, aligned in the same direction. And these passages are aligned towards the setting midwinter sun. That was first shown by Boyle Somerville in 1923. Professor Thom also surveyed the site in the 1940s. What Doug did was to show the key role played by the circles of standing stones. He worked in the area from 1989-92, on the ground and from a helicopter, looking at a total of 25 cairns in all, and building up a photographic record of solar and lunar events which continues to the present day. He showed that there are two types of alignment indicated by the stones. There is a pattern of solar alignments at 45-day intervals. That covers the four quarter-days of midsummer, midwinter and the two equinoxes. And there is also the grouping of the four quarter-days of folklore: Candlemas (February), Beltane (May), Lammas (August) and Samhain (November). And the second pattern that the stones show is the movements of the moon. The orbit of the moon around the Earth is in a slightly different plane to that of the Earth around the sun – and so if we look to the horizon for the positions of the rising or setting moon, we find that they move around as the year progresses. In fact, the motions of the sun and moon go through a cycle – called the Metonic cycle – which takes 19 years before they return to the same relative position. If we follow the rising and setting positions of the moon through one whole cycle, we find that there are extreme northerly and southerly positions. each of the points gradually moves to the extreme, stays there briefly and then turns back again. The extremes in the cycle are called the major and minor standstills. 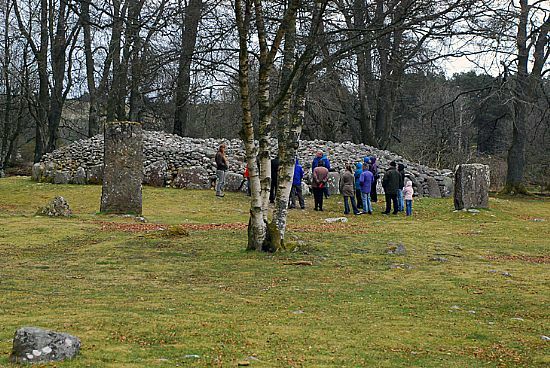 And at the Clava Cairns, Doug has shown that these four standstills are marked by individual standing stones. So the cairns have some deep connection with the movements of the sun and moon, and Doug's photographs beautifully capture this harmony of the calendar. His DVD, Watchers of the Dawn (also available in ebook form), is an ideal introduction to archaeoastronomy.